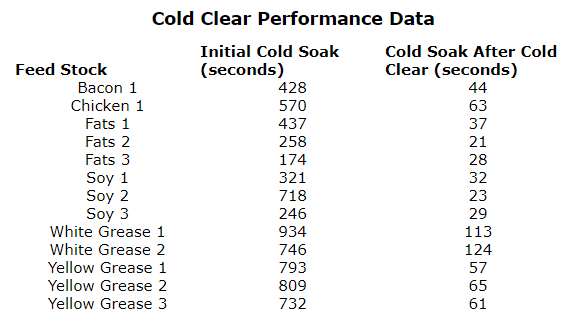 A single pass at 5GPM through the Cold Clear towers will lower your CFPP by as much as 50 degrees. Filter plugging both in the ASTM procedure and in the field has been researched significantly with a range or answers to the single question. Most producers and consumers assumed poor cold flow performance was due to feedstock issues, or even poor biodiesel quality. When data started coming in from biodiesel producers around the nation, the answers became even more confusing. 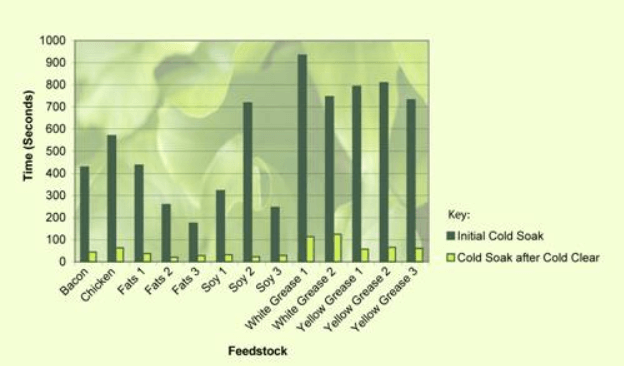 A wide range of cold soak results were found for biodiesel samples from a wide range of cold soak results were found for biodiesel samples from a wide range of feedstock and an even wider range of producers. Obviously the cold flow problem was not just quality or feedstock dependent. Cold Clear TM technology produces a multi-stage filtration /adsorption system that ensures that any potential factors that would initiate crystallization or plugging on the filter do not occur. By sequentially removing certain impurities that create a higher than normal likelihood of surface crystallization on the filter, our Cold Clear technology ensures that your biodiesel can meet the ASTM specification for cold soak filtration. It also ensures that your fleet customers are receiving the very highest quality biodiesel from your biodiesel processor and will minimize system plugging quality issues. Cold Clear is effective for B100 and a range of diesel blends meaning that producers, distributors, or even fleet consumers of biodiesel blends can use it. Schroeder Biofuels and Armor Separations Technology jointly developed Cold Clear TM as the answer for cold flow problems. 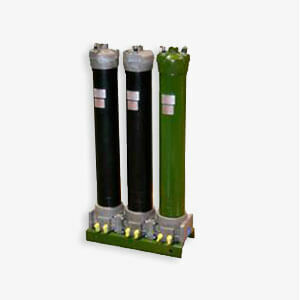 The system is designed to be a single pass three-stage bank of filters/adsorbers that sequentially remove those compounds likely to cause filter plugging. The filter elements are disposable and easy to remove from the filter housings. Each bank of filters is rated to treat a fixed volume of B-100 biodiesel, while biodiesel blends are scaled by the blend percentage. Cold Clear System as the answer for cold flow problems, the system is designed to be a single pass three-stage bank of filters/absorbers that sequentially remove those compounds likely to cause filter plugging, and can be hooked in series with an Freedom Clean Dry Wash Tower, the Cold Clear System also acts as a polishing filter, so no need for additional treating or steps. The filter elements are disposable and easy to remove from the filter housings. The BCC 100 series is targeted for 5 gpm of system flow. Multiple units can be run installed in parallel to achieve higher flow, but based on your current Bio Diesel Processor this won’t be necessary. This will allow you to run your fuel B100 with peace of mind and pass the new IRS Cold Soak test. Filters 18,000 gallons on a single filter change.